In this quick tutorial you'll learn how to draw a Mute Swan in 8 easy steps - great for kids and novice artists. At the bottom you can read some interesting facts about the Mute Swan. 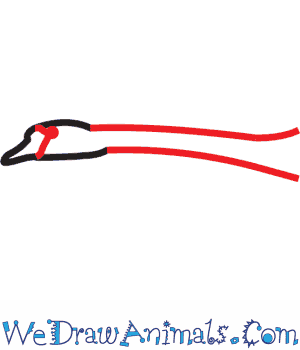 Step 1: Start by drawing the small, pointed beak of the Mute Swan using two, small slanting lines. Then, draw the almost oval shape of the swan's head using gently curved lines. Leave some blank space at the end of the head to draw the neck of the swan. 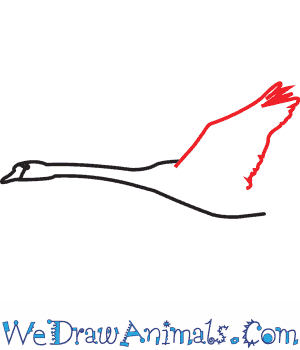 Step 2: From the head, draw two gently curved lines to show the long and thin tube-like neck of the Mute Swan. Draw a tiny oval near the top of the swan's head to show the eye. 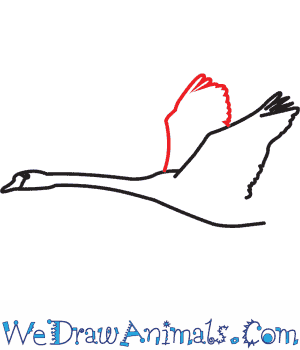 Draw two slanting lines from the eye to show the face markings of the Mute Swan. Step 3: Continue the lower line of the neck into a long, gentle curve to show the belly of the Mute Swan. 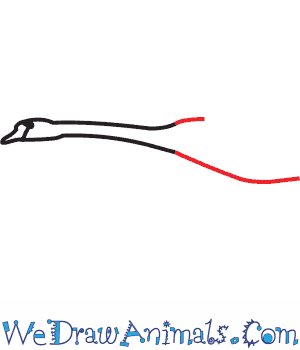 Continue the upper line of the neck into a short, curved line to show the back of the swan. 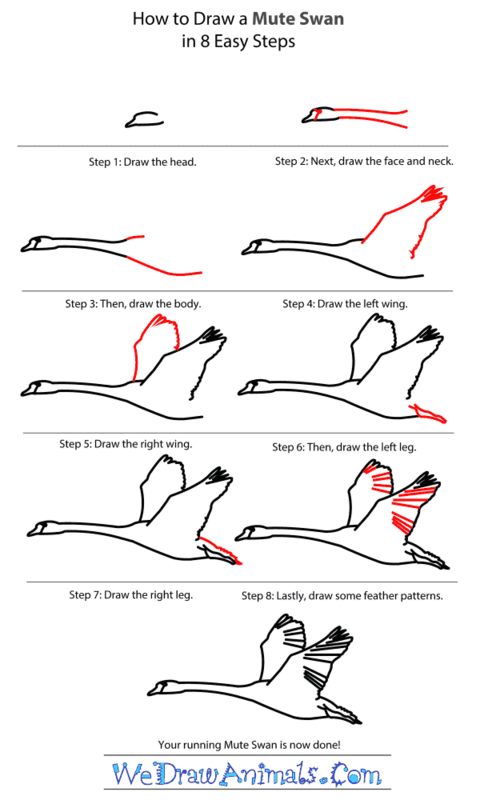 Step 4: Next, let us draw the outline of the left wing of the Mute Swan. Start from the back and draw a bent line to show the top part of the swan's wing. 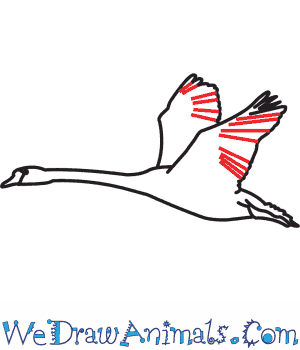 Draw short, wavy lines to show the feathers at the tip of the swan's wing. 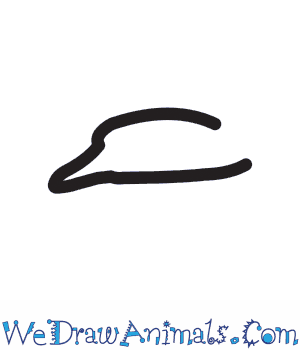 Then, draw a wavy line to complete the rest of the wing as shown in the image. Follow the bend in the top part of the swan's wing while drawing the wavy line for the bottom part of the wing. Step 5: Draw the right wing of the Mute Swan behind the previous one. Use the same method to draw the wing, making sure to draw the feathers on the wing tip and the bend on the edge of the wing. 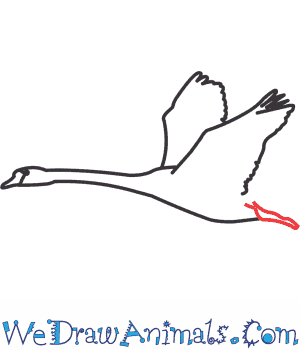 Step 6: Use two curved lines to draw the thin, left leg of the Mute Swan as shown in the image. 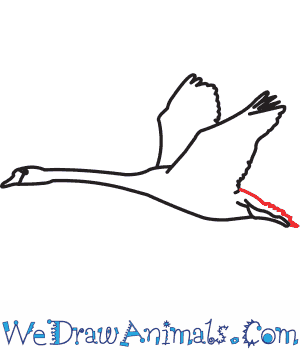 Step 7: Draw two more curved lines next to the previous ones to show the right leg of the Mute Swan. Step 8: Draw small slanting lines along the edge of both the wings to show the outlines of the wing feathers. 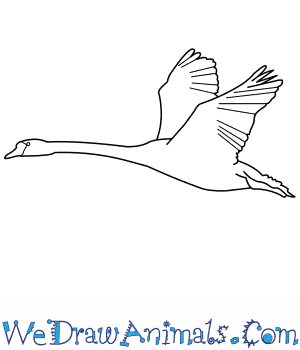 Your drawing of the Mute Swan is now complete and you can color it. The mute swan is a big, beautiful white bird with a long, gracefully curved neck. Their black faces and orange bills make a dramatic contrast against their all-white bodies. They are found in ponds, lakes and parks all around the world. In fact, Mute Swans were brought into North America because some people thought they would make the parks and ponds there more beautiful. The Mute Swan is native to northern and central Europe and Asia. While most Mute Swans mate for life, a Mute Swan may re-partner if his or her mate dies. If a male Mute Swan re-partners with an older female, they will go live on the female’s property, but if he re-partners with a younger female, they’ll stay in his territory! The eggs of a Mute Swan start off a blue-green color, then turn white, and finally end up brown with streaks of brown. Mute Swan babies are called cygnets can leave the nest to swim and eat after just 24 hours. The Mute Swan may be a beautiful bird, but they are very territorial. If they feel their territory is in danger, they will start to hiss. If this doesn’t scare off the threat, Mute Swans can attack by biting and smacking the threat with its huge wings, which have spurs on them. If you see one in a park, leave it in peace. Just stand and appreciate its beauty.